My mom is retired now, so she has a bit more time on her hands nowadays. She treated me to a jewerly making class at a local (to me) crafty place. 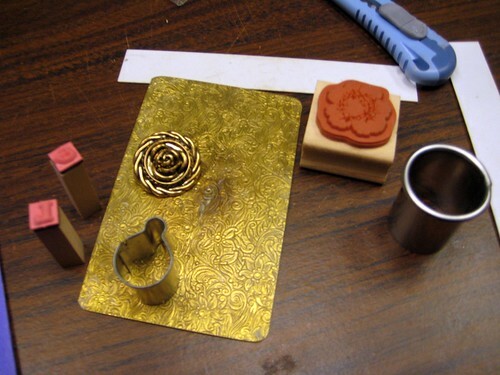 We used Art Clay's precious metal silver clay to make some jewelry pieces. You get a block of silver clay about the size of the lego, and the studio provided all of the tools to finish it. After seeing a short demo, I gathered my tools- brass pattern plate, utility knife, spacers, some stamps and buttons to make a pattern on the clay. 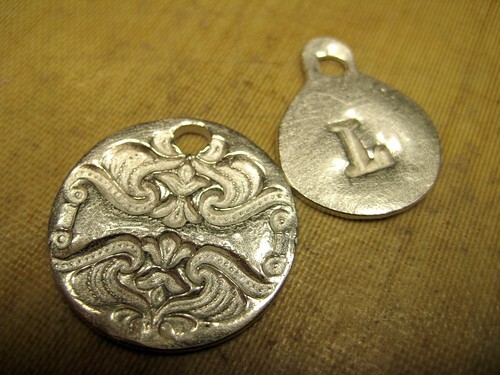 I already had in mind what I wanted to do- a small initial pendant, like you'd see on Etsy. 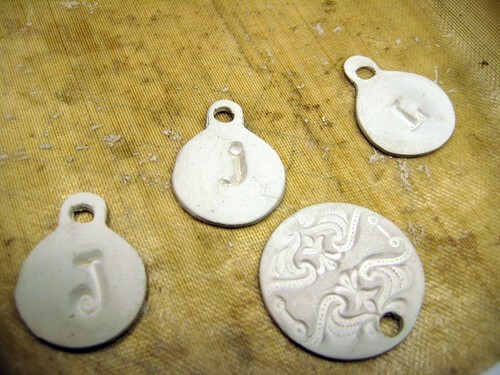 I ended up making three small initial pendants and one larger pendant with all the clay I had. We only had about 10g and it dries quickly, so I had to move move move to make these. The pendant with the lowercase J got kind of wonky b/c it started drying out and I had to start over. To make these, I took a small ornament shaped cookie cutter and lined it up with a small initial stamp- the kind you'd use in scrapbooking. Stamp, stamp, cut and I was done! I didn't get too elaborate with my designs because we didn't have a ton of time. 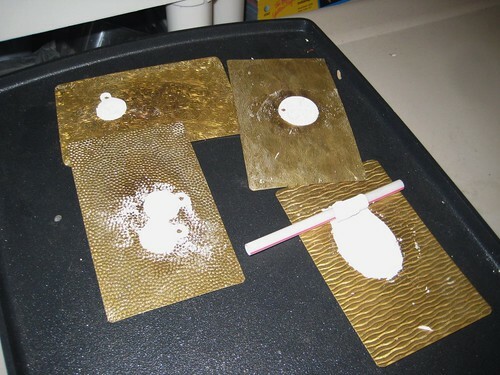 Here is the silver clay drying on a regular old kitchen hotplate. Mom tried to make a free-er form piece. I could tell she wasn't really into the class as soon as the instructor said "let's make something organic," but she gave it the old college try anyway. Her piece is the one with the straw through the bail, which is the part that broke. After drying on the hotplate, the silver clay is in a "greenware" state. It's still very malleable and can still be shaped, fixed, etc. 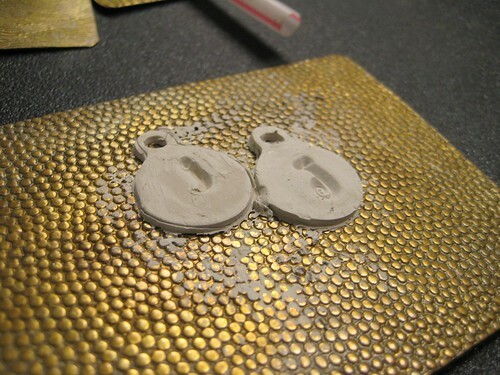 After being fired in the studio's kiln for about 15 minutes, the pendants come out white. I took a wire brush to polish them, then tumbled them in stainless steel shot for another 15 minutes. Tada! Instant jewelry. The Art Clay/PMC silver clay products are kind of expensive- about $16-20 for a 10g brick. I made three small and one medium pendants out of that, with a bit of scrap. But to actually make these (admittedly basic) pieces, it was pretty darn easy. I'll definitely give this another shot. Oh, and I wore the L piece to work yesterday and everyone totally thought I got it online! I've seen these on etsy too and came to your site to learn a little more about how to make them. Loved your post you did an amazing job!! thanks for sharing!